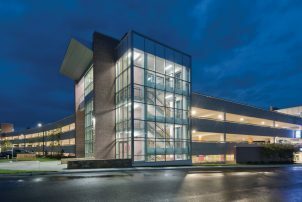 Located in Leesburg, VA, Inova Loudon Hospital’s new parking garage for patients, visitors, and staff looks like it has always been there, which is what the hospital was aiming for. The 765-stall structure was designed to be both easy to navigate and integrate with existing traffic patterns. Emergency-room visitors park on the ground level; visitors to other areas are directed to higher tiers; and staff are assigned spaces in a specific area. Clear sightlines to elevators and stairwells (open to the inside of the garage) provide easier wayfinding and greater security while a two-way vehicular ramp offers passive security and convenience. The cast-in-place structure was designed for minimal maintenance, with best-practice construction and design materials. The garage’s exterior blends harmoniously into the campus. Vehicular portions are buff-colored, precast, concrete spandrel panels with a sandblasted finish; pedestrian areas are enclosed in highlighted masonry and glass. Wayfinding clearly identifies entrances, elevator and stair locations, and outside directional information. Double-sided elevators and lobbies offer direct access from the parking areas to the lower-level entrance as well as a future pedestrian bridge. Pedestrians enjoy dedicated waiting and walking areas that protect them from moving cars, and extensive glass walls offer natural light and views of the campus. Originally estimated at $16 million, the project stayed under budget, thanks to ongoing cost-control measures that included slightly raising the lower level to save $1 million in rock removal.